I have been itching to see the magical falls of Havasupai since last year. When I got invited by a fellow adventurer, I gladly said YES! Havasupai, also known as "the people of the blue-green water," holds the most magnificent waterfalls I’ve ever seen in my life. The brilliant turquoise water is a must see grandeur, but getting to this magical place was no walk in the park, especially with a hefty 25 lbs. pack on my back. The trailhead to the waterfalls began at the Hualapai Hilltop and down a one-mile switchbacks. 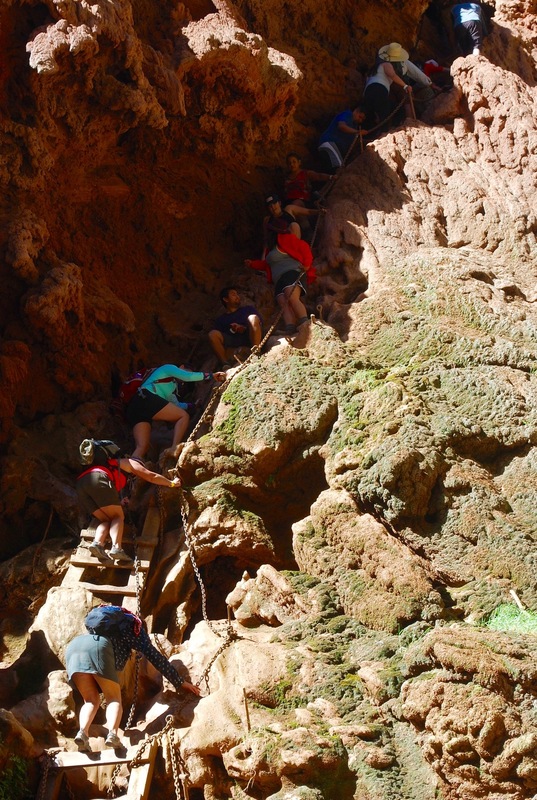 The trail then continued along the southwest rim of the Grand Canyon and through the Village of Supai, where the Havasupai Indian Tribe resides. It was a long eight-mile journey to the town, but every step, every pain, and every sweat was worth it. The village had a couple local stores opened, so we treated ourselves with some ice cold drinks and delicious fry bread! My group and I were then greeted by a local store owner named Cleave. He was kind enough to share a short little tale about the unique rock formations that surrounded us: the Lion, the Traveler, the Prince, the Bride and the Bear. Cleave then advised that we must leave all of our burdens behind and focus on the incredible journey ahead - and I certainly agreed. 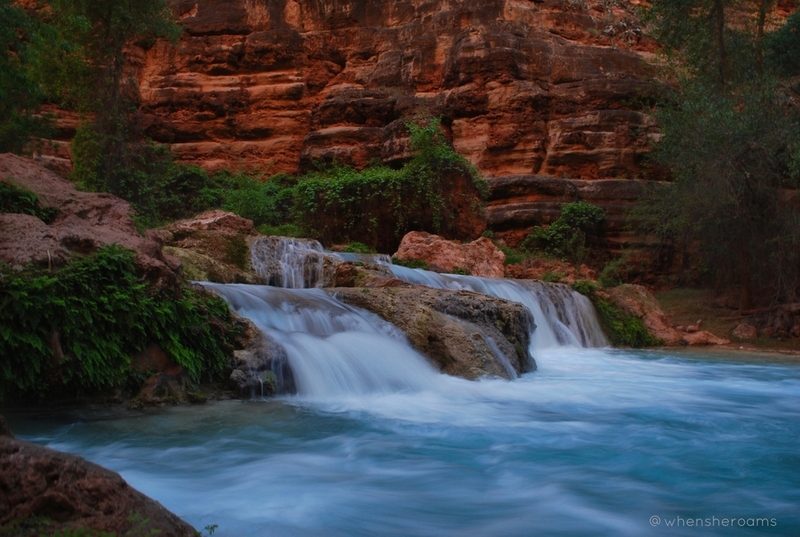 After a two mile hike from the town, Havasu Falls greeted us with its striking beauty. 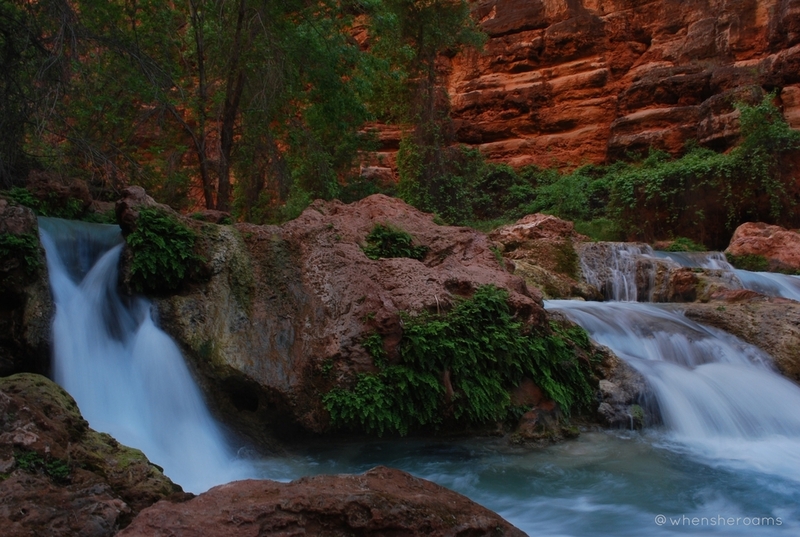 Havasu Falls drops approximately 100 ft. into a stunning turquoise pool. The color of the water comes from the reflection of the limestone, built up from a large amount of carbonated calcium. It was quite a mesmerizing site. All I wanted to do was to jump in the water! Once we finished setting up for camp, a handful of us scurried back to Havasu Falls. We spent an hour playing in the water before nightfall, and it was so much fun! We just chilled, swam and took photos. It was the perfect reward after a long day of trekking. After an exhausting yet amazing day, the “free birds in Supai” (that’s what we decided to call ourselves) gathered together for a nice “no campfire” circle. We then had the chance to get to know each other. We even played some card games and talked about shape shifters lurking at night – which by the way did not help me sleep at all. I was the only one sleeping outside with a Bivy! I was terrified when I heard little footsteps in our camp site. No joke. Just a few short walks from our campsite was the great Mooney Falls. The trail to the bottom of the falls is certainly not for the acrophobias. Mooney Falls is tallest out of the five falls in the reservation, as it rises 190 ft. above the ground. The only way to Mooney was down the ladders, chains, and bolts, installed on the side of the canyon. Some people had a hard time descending to the falls. It was slippery and steep. Luckily for me, I had some experience hanging off sharp drop offs from my hike to Angels Landing, in Utah. After a lovely afternoon at Mooney Falls, the #FreeBirdsinSupai were off to Beaver Falls! The trail was hard to track at first, as there were a few creek crossings and treacherous areas. But the journey to this place was like going through the world of Avatar. There were stunning gorges, beautiful landscapes and short waterfalls along the creek. At the end of the trail, there were taller series of falls. They were great for cliff jumping and exploring. Beaver Falls also had many dining benches, that were overlooking the waters. So after an hour of exploring, we reunited for a nice picnic. Nothing beats having lunch in the desert oasis! After two days in paradise, it was time to pack up our gears and head on back to our cars. A few from the group had a flight to catch, so they got up before sunrise to get in the line for the helicopter. Many visitors preferred this route since walking back up the canyon can be grueling. I wanted to have the “full experience,” so I decided to walk back on foot with the rest of the group. I did have the mules carry my stuff back to the Hualapai Hilltop. I just couldn’t bare the thought of carrying my pack for another eight-mile journey. Every inch of my body was so sore! Plus, I wanted to take that chance to enjoy the scenery and spend a little bit more time with the new friends, I’ve just made over the weekend. My weekend at Havasupai tribal lands is definitely one for the books. Arizona's Garden of Eden has given me so much more than its natural beauty, and it will forever hold a special place in my heart. This place has brought me these wonderful, hilarious and adventurous people in my life. I'm looking forward to another expedition with these folks. Three days just wasn’t enough. I'm most definitely coming back. Who's in?! A travel & lifestyle blog about hiking, working and traveling. Hey there! My name isMargareth. 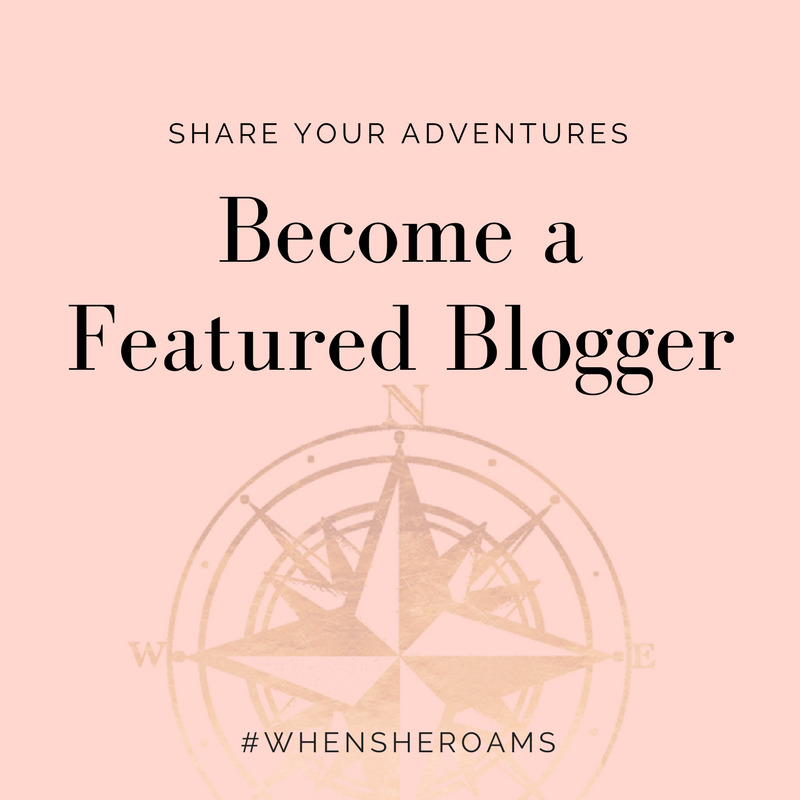 I'm a curious individual, with a great desire to explore eclectic cities, gaze at the great wonders of the world, and more importantly - inspire others to live, love and travel.